If there is a French woman more famous than Marie Antoinette, it would undoubtedly be Joan of Arc. We all know her story, hearing the voice of God and his angels, she traveled to the dauphin in order to lead his army and regain the French throne from the English. The legend of Joan of Arc includes her picking out the dauphin from amongst a crowd of people, having never seen her before. What the legend fails to recognized, is the powerful influence wielded by the dauphin’s mother-in-law, Yolande of Aragon, the Queen of Sicily. Six hundred years is a long time to wait for answers to so prominent a mystery. For those who wonder after reading these pages how it is possible that the evidence of Yolande’s involvement in the story of Joan of Arc has never before been adequately explored, I can only respond that there is no more effective camouflage in history than to have been born a woman. Goldstone lays out her argument for Yolande’s importance in the French victory in the Hundred Years’ War in a clear and fairly concise manner. The Maid and the Queen is laid out very well, broken into three sections: Before Joan, Joan of Arc, and After Joan. Particularly interesting is Yolande’s work before Joan appeared on the scene, and her early work with Joan. Goldstone certainly makes a strong case as to Yolande’s place in bringing Joan to the forefront, from the genesis of the prophesy that a maid would regain France, to the fact that Joan was one of many (at least 20 people in 1428) who claimed that God wanted them to deliver a message to the king. 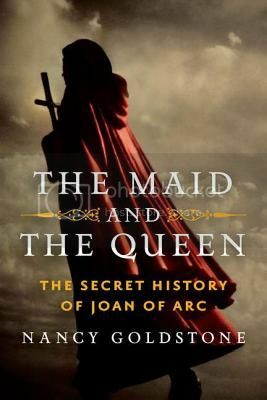 The Maid and the Queen is a fascinating account of Joan of Arc, and the secret history of the powerful women behind France’s victory in the Hundred Years’ War. This is the story that you didn’t – and should – know. Recommended. This sounds really good. Joan of Arc is one of those figures I only have some basic knowledge of but really find fascinating. Adding it to my list. I have read a few different accounts of the life and times of Joan of Arc, and the influences she had on the politics and leaders of her time, but this sounds like it comes at things from a very different angle, and it sounds like a book that I would love to read. Great review on this one today. It sounds excellent! Oh, this would be interesting. I will add it to the wish list! I like that this book doesn’t just end with her death but also examines the world “After Joan”. Sounds like an interesting read! I have always been interested in Joan of Arc but haven’t really read anything about her. I took like how the book is broken into section that explores the time before and after Joan. Thanks for this review.